We love beautiful British Columbia and what it has to offer at different times of the year. If you are interested in finding fresh, local, wholesome, real food from the people who grow it, then check out this link to find a local neighbourhood Farmer's Market in your area. Want to know what foods are currently in season? When you sit down to eat, have you ever given much thought about where your food was grown, how it was grown, or who grew it? Browse through this BC Farm Fresh listing to find a variety of family friendly local farms and businesses that allow you to buy local, fresh, and direct from the farm items such as vegetables, fruits and berries, free-range eggs, meats (organic poultry, non-medicated, grass fed beef), dairy/goat milk and cheese products, specialty garden produce, culinary herbs and even some nursery stock. Here is another link to a variety of other home grown BC Businesses, Farms and Events that you might want to explore. Remember buying local not only supports BC farmers and growers, but it can reward you with some of the freshest nutrition, best flavours and pleasures of the season. In both Canada and the United States (US), GMO foods are not required to be labelled as such, so it is challenging for shoppers who want to find Non-GMO containing foods to differentiate between GMO and Non-GMO foods. Living Non-GMO is a website developed to help inform consumers where to find and purchase brands of verified non-GMO foods. They believe that everyone has a right to know what’s in the food they’re eating and feeding loved ones. Not sure what GMO’s are? Here is a brief summary. Genetically Modified Organisms (GMO’s), aka “genetically engineered” in the US, are living organisms (plants, animals, bacteria and viruses) whose genetic material has been artificially manipulated by scientists in the laboratory. This results in genetic traits or combinations that do not occur in nature nor would ever result from traditional crossbreeding. Currently, the list of GMO foods grown and cultivated in Canada include corn, canola, soy, sugar beets and alfalfa. Other GMO crops that are imported into Canada include cottonseed oil, papaya (Hawaiian), squash, zucchini and some US milk products (if they contain bovine growth hormone). The Canadian GMO food list is still growing and getting more diverse, and as of June 2017, genetically modified atlantic salmon has been approved to be grown in a fish factory in Prince Edward Island and will be available for sale in Canada. Until then genetically modified salmon had not yet been produced anywhere in the world. Current labelling regulations in Canada do not require GMO salmon to bear distinctive labels in stores. As of March 2019, the United States has finally given the go-ahead to import, raise, and sell GMO salmon. But, unlike Canada, the US requires these fish to be labeled as GMO salmon for informed consumer choice. Are GMO Foods safe? There is no universal consensus on the long term safety of GMO foods. Even with careful scrutiny, scientific researchers acknowledge that while adverse health effects from GMO foods are not currently detected they could develop or be discovered over time. Consequently, many developed nations do not consider GMO’s to be sufficiently tested and thus not proven safe. In fact, more than three dozen countries around the world, including Russia, Japan, New Zealand and many of the countries in the European Union (EU) have placed significant restrictions or outright bans on the production, cultivation or sale of GMO containing foods. However, in both the US and Canada, GMO’s have been approved for use based on studies conducted by the corporations that have created them and profit from their sale, rather than independent peer-reviewed research. There is a growing body of evidence that connects GMO’s with off-target effects and unintended consequences such as environmental damage and possible health effects (including changes in intestinal microflora), so many shoppers want to purchase non-GMO foods. All Certified Organic foods are also non-GMO foods because genetic modification is prohibited in organic farming. The Non-GMO Project organization hosts the Living Non-GMO website listed above. The new 2019 Shopper's Guide to Pesticides in Produce. aka "Dirty Dozen" and "Clean Fifteen". Many people want to reduce their exposure to pesticides in produce but cannot find or afford an all-organic diet. Using the latest Shopper's Guide chart from the Environmental Working Group (EWG.org ), along with your food budget, will help you wisely prioritize your selection of organically grown foods. How to use this information: The EWG Shopper's Guide annually ranks 47 foods (fruits and vegetables) by the level of pesticides that are typically found in the foods when they are conventionally grown. Knowing which foods test high in pesticides can help you prioritize the foods you may want to purchase in an organic version. Foods ranked first on the chart (with the lower numbers, e.g. 1 - 12) are higher in pesticide residues, with #1 (Strawberries) being the highest contaminated of all 47 foods tested. 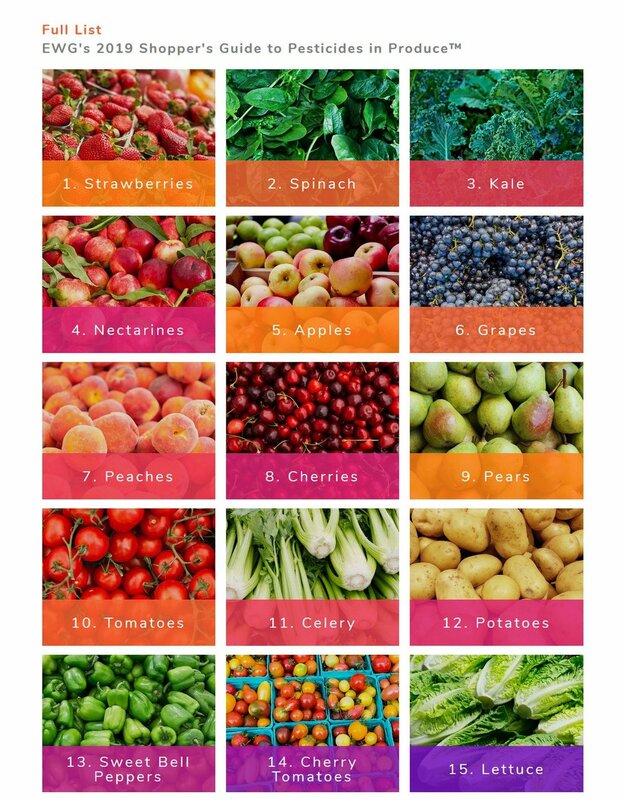 Consequently purchasing organic varieties of these foods ranked 1 - 12, also known as the "Dirty Dozen", should be a priority. Foods with a ranking score over 33, also called "Clean Fifteen", are much lower in pesticides and are less of a priority to insist on organic. Regardless of food ranking, always remember that the health benefits of consuming more fruits and vegetables in your diet, even if they are not organically grown, are better than not eating fruits and vegetables at all. Why should you care about pesticides? The Environmental Working Group (EWG) points out that there is a growing consensus in the scientific community that small doses of pesticides and other chemicals can have adverse effects on human health, especially during vulnerable periods such as fetal development and childhood. Pesticide runoff may also contaminate groundwater and otherwise damage local ecosystems. So, to help promote the health of the planet as well as your own health, it's best to buy organic whenever possible, including when you are purchasing any of the foods referred to in the chart above. Microorganisms such as bacteria, virus, fungi and parasites may infect humans. When an infection occurs it is commonly treated with an antimicrobial medicine (such as an antibiotic, antiviral, anti-parasite or antimalarial). There are a growing number of diseases, especially Infections caused by bacteria, that have become resistant to current antibiotic drugs, e.g. diseases such as pneumonia, tuberculosis, gonorrhea, salmonella, and MRSA (methicillin-resistant Staphylococcus aureus). This makes some strains of these bacterial diseases harder to treat as the antibiotics used to treat them become less effective. Antimicrobial Resistance (AMR) is the term used when a microorganism (like bacteria, viruses, and some parasites) develops the ability to stop an antimicrobial drug (such as antibiotics, antivirals and antimalarials) from working against it. There is an increasing global awareness of this Antimicrobial Resistance (AMR) problem because it leads to longer hospital stays, higher medical costs and increased mortality. Although antibiotic resistance occurs naturally, the misuse of antibiotics in humans and animals is accelerating the process. This AntiMicrobial Resistance (AMR) website outlines the naturopathic approach to help reduce the overuse of antibiotics. The link from the World Naturopathic Federation shows the naturopathic treatment for many common infections (digestive, respiratory, urinary and skin), with supporting research references. It also includes a handy guide that can help distinguish the clinical difference between a flu versus cold based on presenting symptoms. To help reduce the risk of AMR, only use antibiotics when they are absolutely necessary and include natural treatment options as an important part of your treatment plan. Remember - don’t use antibiotics for viral infections! Low Dose Naltrexone (LDN) is a novel, new anti-inflammatory treatment that utilizes very low doses of an old pharmaceutical drug in a new, experimental way. Because Naltrexone is in a class of drugs known as opiate antagonists, it was originally used in the 1980's in much larger doses (50+ mg) to treat addiction to opiate drugs such as heroin or morphine. Unfortunately these large doses of Naltrexone had many undesirable side effects which caused many doctors to eventually abandon its use. After decades of disuse it was rediscovered that a very low dose of oral Naltrexone (at less than 1/10 the dose previously used in the 1980's - hence the name Low Dose Naltrexone) may be very effectively used in the treatment of many, modern chronic diseases that involve pain and or inflammation. Preliminary research using LDN is certainly promising in conditions such as Fibromyalgia/M.E., Multiple Sclerosis, Crohn's Disease, and Complex Regional Pain Syndrome. However, the use of LDN is considered experimental in conditions as varied as ALS, Parkinsons, CFS, Gastrointestinal disorders including SIBO, and Ulcerative Colitis, Autoimmune diseases, HIV/AIDS, some types of cancer, Hashimoto's thyroiditis, and similar diseases that all come from a common disease state — inflammation. LDN appears to be able to help normalize the immune function and or nervous system in these inflammatory states. The LDN Research Trust website helps patients learn more about LDN treatment, promotes education and shares research, and can enable patients to make an informed choice about LDN therapy. At the Family Health Clinic we have a doctor who has experience in using LDN and is able to write a prescription for those patients interested in trying this type of novel therapy. Healthy Families BC website has been a provincial endeavour since 2011, aimed at improving the health and well being of British Columbians at every stage of life. Healthy Families BC encourages and educates British Columbians on how to make healthier choices and reduce chronic disease by focusing on four key areas: healthy eating, healthy lifestyles, resources for parents, and fostering healthy communities. When you visit this website you might want to check out some of the articles, resources and tools available for pregnancy, birth, and parenting; healthy and budget wise shopping; choosing low sugar foods or being sodium savvy; and aging well for mature adults. FamilyDoctor.org Award-winning, trustworthy, and credible health information and tools for patients from the American Academy of Family Physicians. A great resource for a description of health conditions, symptoms, etc.